Home » Barefoot Ted » Boulder Boot » collection » Dash » elf » Lems » Luna » Moc3 » Moccasin » Portlander » Roo » RunAmoc » Sandals » shoe » shoes » soft star » Soft Star Shoes » Vivobarefoot » Xero Shoes » How Many Shoes Does a Shoe Elf Own? How Many Shoes Does a Shoe Elf Own? When I began working at Soft Star Shoes back in early 2011, I swore I would not get into the minimalist/barefoot thing because I did not want to throw away and replace all my conventional shoes. Shoes aren't cheap, after all, and I had just spent a pretty penny for a brand new pair of Asics runners. My soon-to-follow bout with plantar fasciitis quickly put an end to that idea. As soon as I realized how much better my feet felt when barefoot or in Soft Stars, the old kickers—including the still new Asics—didn't stand a chance. Now, three years later, I look at my vast minimalist shoe collection with complete shock. If I didn't have them in front of me then I would have only remembered acquiring 3-4 pairs. I like to think of myself as a minimalist in life, not just in running (haha), meaning that I abhor clutter and don't like to own things I don't need or use. Somehow, an excessive amount of shoes seemed to have sneaked past this philosophy... which is obviously why they're called "sneakers" (double haha). 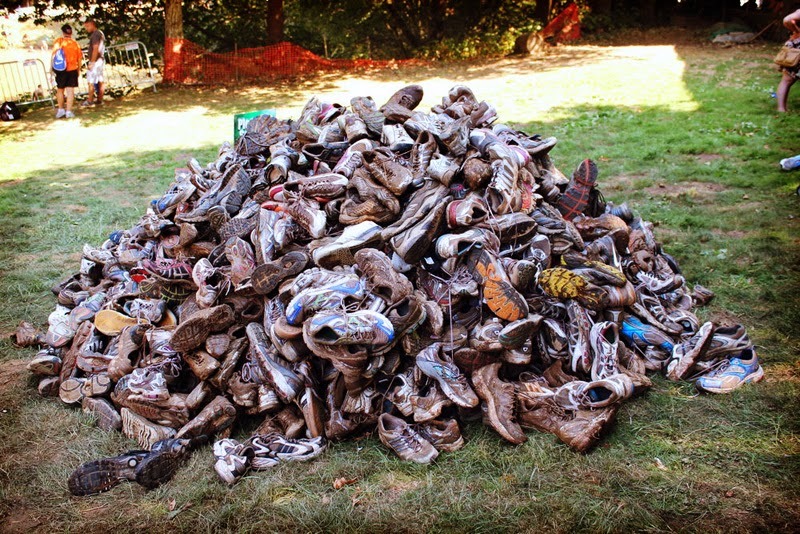 So, how many shoes does a shoe elf own? Doesn't sound like a minimalist's closet, does it? I guess it's not so unusual for a runner's closet... until you consider that only two of these pairs are running shoes. My burgundy and black suede Roo moccasins were my very first pair of Soft Stars, and the shoes that showed me foot pain can be cured by going minimal or barefoot. I keep them under my desk at work and after three years they're still in excellent shape, if not a bit dirtier. For a while, I was bringing them home every day to wear around the house, then back to work the next day. I finally decided it was work the convenience to have two pairs so I can keep one at each place, and that led to the suede moss green and chocolate pair in the photo. This is Soft Star's signature moccasin, and the one they've made for all ages since 1985. It is handcrafted with super soft suede uppers and an even softer sheepskin innersole. The natural suede outersole literally molds to your feet to give a natural, uninhibited range of motion. Aside from being barefoot, nothing makes my feet feel better. One of the very first pairs of shoes I bought from Soft Star was a comfortable pair of Dash RunAmocs in forest green with chocolate suede backs and a 5mm Trail sole. These shoes were incredibly comfortable and I wore them daily. I began to think I needed a backup pair for when they wore out, and also something a bit dressier for those rare formal occasions. This led me to a sleek looking pair of the same Dash style in smooth burgundy and black with a bullhide leather sole. I absolutely love this natural and flexible sole... so close to barefoot! These were my two go-to casual outdoor shoes for a long time, and also my only two running shoes, until I wore right through the suede heel back of the green pair (in Soft Star's defense, this was one of the first pairs I soled myself and I cut the rubber heel too short, leaving the back leather vulnerable). When that happened, I figured I should not only replace it, but also replace the other pair because I assumed it would also wear out soon. So I bought another pair of Dashes in a different variation of green and brown suede and an identical pair of the burgundy and black pair. To this day, 2+ years later, that first burgundy/black pair still hasn't worn out. Dash RunAmocs for casual use (except for the green Portlanders in the lower left). When I began marathon training, I decided I deserved some running shoes exclusively for running. I also figured this would keep my casual shoes from wearing out prematurely. It just so happened that the designers at Soft Star needed some runners to test a new innersole leather for color bleeding, so they offered me two free pairs of Dash RunAmocs on the condition that I ran in white socks and took photos of them afterwards. I chose both in perforated leather and the 5mm Trail sole, which is still my fav running sole for any kind of surface. One was green and white with perforated leather only on the sides to help keep my feet dry and warm in colder weather, and one in blue and white with perforations all over the front and sides to keep my feet ventilated on warmer days. This blue pair was also the pair I was saving for my Hawaiian marathon. Over a year later, they're both still holding up great and still my preferred running shoes. RunAmocs for running. Two pairs of Dash, one Moc3. Around that time, a pair of size 13 Moc3 RunAmocs was made with a stitching error and couldn't be sold. I was the only one whose feet they fit, so voila... free shoes! The Moc3 is basically a running "sock" that stretches around your foot with a thin 2mm Vibram sole, and a favorite among barefoot runners. While I do like to run barefoot on occasion, I run on a lot of gravel and prefer not to have max groundfeel all the time. I still use these shoes quite a bit, though, because they are very easy to slip on and off when I need to run outside quickly. They are also incredibly comfortable for running errands around town and rolls up easily to fit in a pack for a camp shoe. I think I would spend more time running in them if I build up some more tolerance for gravel. This is one of Soft Star's newest designs. It's based on the Dash RunAmoc, but instead of being glued to a running sole it's stitched to a 4mm Geo sole. This sole is incredibly flexible with great traction. I received this pair for free as another test pair. The shoe designers weren't sure how our suede leather would hold up for the front upper of this shoe, so my test pair was made with two different grades of suede for testing and comparison: a thicker grade for the left foot and a thinner grade for the right. As you can see from the photo above, the green color varies slightly between the two, but then again... free shoes! In the end, Soft Star decided to just offer smooth Nova leather for the front of the shoes, not suede, so mine are a very limited edition. While I prefer the look of my Dashes for appearance and style, the Portlanders are incredibly comfortable and I've found the rim of the sole on this new shoe gives some extra durability to the upper leathers around the toe and heel. I haven't tried running in them yet because I still prefer the tread on my 5mm Trail Dashes, but it's a great everyday walking shoe. 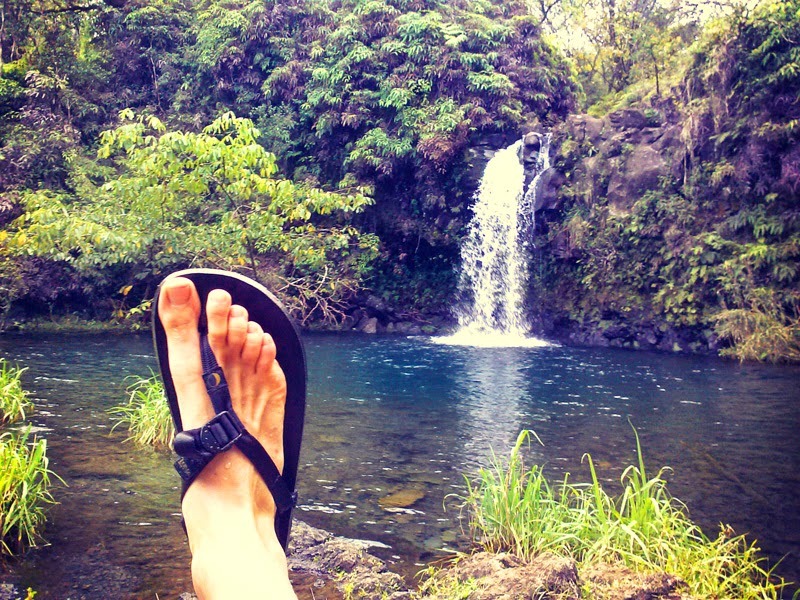 My trusty Lunas on my trip to Hawaii earlier this year. I jumped off many waterfalls in them. These huarache sandals are AWESOME! Chacos used to be my go-to summer sandal, but after transitioning to minimalist footwear their arches and raised heels now make my feet incredibly uncomfortable. After reading Born to Run, I immediately went on a search for a good minimalist huarache. There are a lot of these huarache-style sandals on the market right now (one of my other favs is Xero Shoes—Steve Saschan's videos are sure to put a smile on your face), but I prefer the soles and ATS lacing system of my Lunas. I'll admit I have a personal bias toward the company that evolved from my job, but that doesn't make the sandals any less spectacular. The elves at Soft Star formed a good relationship with the Luna Sandals several years ago after helping Barefoot Ted, their founder, develop his product by sending him soling samples. They're also our Northwest neighbors since they make all their shoes in Seattle, Washington. 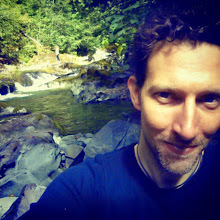 I got to know their marketing monkey, Tom Norwood, after I interviewed him about his experience running the Caballo Blanco Ultra for the Soft Star blog. After getting my first pair of Monos from Luna, I fell in love with them immediately and have worn them regularly in the summer ever since. I'm also happy to say that Soft Star is now a retailer for Luna, so you can buy their sandals from our website. The Soft Star elves continues to have a good friendship with the Lunar monkeys. For more options and info, check out the Luna website. My most recent acquisition. It's hard to find a good minimalist hiking shoe that covers the ankle. Lems has a beautiful Boulder Boot, but it isn't waterproof and their description says isn't intended for durability on rough trails. Until Soft Star develops a dessert boot with our Trail or Lightning sole (#1 on my wish list), Vivobarefoot's Off Road Hi boots are the only other satisfactory option I've found. This boot is fully waterproof and features a zero-drop sole lined with their patented chevron tread. A friend let me try out a pair of Vivobarefoot runners with this tread pattern and I can attest it's one of the best for traction on muddy trails. As for cons, there's a bit of a toe spring on these boots that I'd rather do without, and the uppers are more stiff and rigid than I prefer. Contrary to common preference, I want a hiker that allows my feet and ankles to pronate and supinate naturally (see this article I wrote for the Soft Star blog for my reasons). Vivobarefoot does offer another hiking boot with a slightly lower top, the Synth Hiker, but it isn't waterproof and I couldn't find it available in my size—even their website was consistently sold out. I should add that for most hikes my Dash RunAmocs do fine, but on intense backpacking trips I want this waterproof ankle coverage. They're also good motorcycle boots, but I'm thinking about trying the Lems option for that. Also, while I purchased this boot in the trendy black grunge color shown in the photo above, it appears that this color has been discontinued and the Off Road Hi style is now only available in brown. 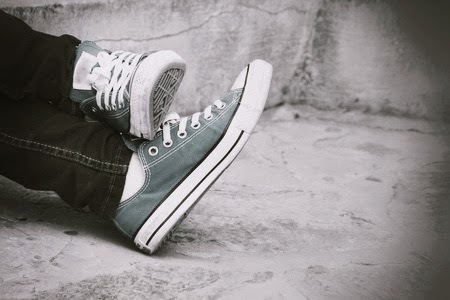 "It was punky and snotty to wear sneakers instead of shoes. Punky and snotty was very important for the Ramones"
What can I say, I was a punk rocker in my younger days and I just can't part with my last pair of Chuck Taylors. I wore many colorful variations of these shoes to see a lot of memorable bands in my 20s. The lone sage green All Stars that remain in my closet are by far the oldest shoes I own and the thought of throwing them out is like abandoning a child. I only wear them on rare occasions now, usually when cycling around town, but as far as conventional shoes go they're pretty minimal. Heck, before cushioned Nike shoes came along, all athletic shoes were Chuck Taylors and injury rates were allegedly much lower back then. These are the only other shoes that survived the great minimalist purge of 2011. I care nothing for these cheap shoes, which is why I still have them. I live on a farm, so they're for trudging through the horse pen when it's full of manure or for mowing the lawn when I don't want my other shoes stained green from cut grass. They do hurt my feet when I wear them for prolonged periods, so they're just around for brief dirty chores. And there you have it... the full shoe rundown from a Soft Star elf... and probably more information than you've ever wanted to know about some stranger's shoe collection. What's in your closet? Feel free to share below. Thank you so much for sharing with us. I'm thinking of purchasing a pair Soft Star shoes and I hesitated between the Portlander and the Dash. I kind of fell in love with the bullhide sole but I'm kind of poor so I think you convinced me that the Portlander would be more durable in the long run. I also think that it would be better for wet weather as I can't afford a pair of shoes for each weather. As for your question, I'm kind of new to minimalist footwear so I only have one pair of Xero Shoes huaraches. As for the rest of my shoe collection, the only other pair I wear is old New Balance sneakers with the sole all hardened up. They are relatively comfortable but I can't wait to replace them with minimalist shoes. Does Crocs count as shoes? I only wear them as easy slip on shoes when I go outside the house in the summer. As for the pairs I don't wear, I have, like you, a dirty work pair of old sneaker and a pair of casual dress shoe that have uneven soles. It was the shoes I wore everyday before I purchase my Xero Shoes, I only noticed they were uneven after I wore only my sandals for a week. A happy happening because I don’t want to ruin my feet and back. I'm also looking for minimalist winter boots but that's another (long) story. Thanks for sharing, Coccinelle. I hope your transition to minimalist shoe is going well! Yes! It's really exciting! I finally found what I'll do for winter! It's a cheap solution that I found only 20 km from home. I can't wait to find if it will work out or not.